Clover Club Bootlegger is obviously designed to pair with Johnny Valone, Blind Fighting, and similar "exhaust to..." effects. It also pairs well with shutdown decks using Unending Festivities and the like. 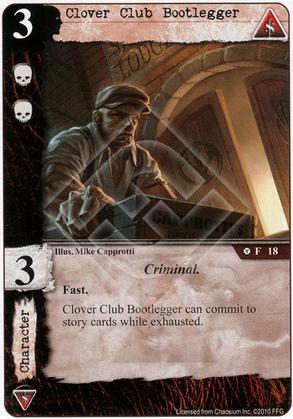 A little sneaky value that the Bootlegger brings is versus Terror. Yes, the Bootlegger can go insane, but he doesn't require the usual two turns in order to get back in the action. He's ready to resume his bootlegging as soon as you restore him. Every deck needs a few cards like CCB. He'll do the dirty work, so your stars can shine. CCB is a dependable 3/5 stars.